A selection of folksongs performed by two of Australia's most acclaimed international artists, presented in Super Audio Hybrid Surround. Steve Davislim and Simone Young are reunited with Melba Recordings to present a collection of Benjamin Britten’s Folksong Arrangements. This new CD follows Seduction (MR301108), their highly praised exploration of orchestral songs of Richard Strauss. Australian-born Simone Young is internationally recognised as one of the leading conductors of her generation. For this recital she puts down her baton and plays the piano. As well as being an outstanding composer, Benjamin Britten was one of the greatest accompanists of last century. Not only did he bring the full experience of his theatrical writing to colour the word settings, then, but to his piano parts as well. Ms Young’s playing is an equal part in conveying the atmosphere and emotion of these deceptive miniatures. Both in Europe and in the United Kingdom, the end of the 19th and beginning of the 20th centuries witnessed the development of an appreciation of nature and the rural idyll which had long been taken for granted. The tentative activities of various ‘back-to-the-land’ movements, which seem now to presage our current ‘green’ environmental interests, were not restricted to planting more trees or recycling waste more efficiently: they were much more catholic in their conception, and we can today be grateful for their interest in all forms of indigenous or local art, in farming techniques, forestry, music, literature and even religion. From the basket-weaving of the Arts and Crafts Movement (which flourished between 1880 and 1910), to the folksong collecting habits of individuals such as Cecil Sharp, Maud Karpeles, Percy Grainger, Zoltán Kodály or Béla Bartók, can be seen a last-gasp attempt to capture a snap-shot of a world, which had reached its zenith during the reign of Queen Victoria but was soon to be all but destroyed by the First World War. This coupled with the timely invention of new recording hardware such as the phonograph and the wax cylinder — portable enough to take on the back of a bicycle — mean that today we can be grateful that the musical gemstones of folksongs were not entirely lost. At the same time, however, we cannot help mourn that it was not possible to salvage even more. In the rural, allegedly ‘unsullied’ context of British village life, it was believed the most authentic picture of local culture could be acquired. Certainly there were urban folk ‘working’ songs, but due to the high residential instability of city populations, these have rarely survived with any reliable geographical identity. The racial issue also, strong in the late 19th century and to be tragically expressed later in the 20th, found a home in the early folksong movement, though appropriately under the guise of ‘nationalism’. Indeed, Vaughan Williams, in Music and Nationalism, articulated the view that folksong had helped the British people identify and focus more strategically on what de fined them as a nation. The Australian Percy Grainger, who had trawled the farmhouses and workhouses from Lincolnshire to Jutland in Denmark, would have concurred, as would so many others of that ‘camp’, such as Roger Quilter, Herbert Howells, John Ireland, Granville Bantock, Charles Villiers Stanford, George Butterworth and Arnold Bax. They perceived in folksong a series of wonderful musical effects which embodied for many listeners the very essence of their understanding of being ‘British’. Sung in fields, factories, workhouses and schools, these brief musical vignettes provided a philosophy which, while perhaps ‘homespun’, nevertheless could have depth and poignancy amid its simplicity. Britten’s love of the folksong genre is palpable, and it was clearly shared with Pears. 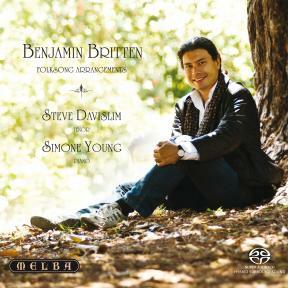 But Britten treated the songs with a different sort of respect from those composers and collectors cited above. He recognised in them the need to take the original not as a rigid template, but as a guide alone, from which melodic and harmonic enhancements, and sometimes even words, could be adapted. Indeed, such a process of ‘sustaining’ folksong rather than ‘preserving’ it was entirely normal in folksong. As knowledge and familiarity with new songs spread across the country, adaptations were made in order to give significance and meaning to the local audience and performer (‘Country Gardens’ would be an excellent example of such metamorphosis, for this original melody, collected by Cecil Sharp and used most notably by Percy Grainger, manifested also as ‘The Vicar of Bray’, both at one time regularly sung by British school children nationwide). The listener should not, however, be seduced into believing that Britten set folksong simply because he enjoyed the form. As Paul Kildea points out in Selling Britten: Music and the Market Place, for many years Britten avoided setting any text which might carry with it royalty implications. This was a difficult task and works such as ‘Tom Bowling’, for instance, were not published until 2001 due to royalty complications. Others, such as ‘The Salley Gardens’, on a text by Yeats, were more straightforward, and the royalties were paid — coming, in fact, directly out of Britten’s royalties and thus always representing for him a financial implication. But apart from these more unusual examples, folksong, due to its relative antiquity, rarely carried with it any tangible intellectual property, thus making Britten’s lot a great deal easier. Britten’s most significant contribution to his contemporary discussion of the significance of folksong was in an article entitled ‘England and the Folk- Art Problem’, and was published in the January edition of Modern Music in 1941 (reprinted in Paul Kildea, Britten on Music, Oxford University Press, 2003). ‘The quiet, uneventful charm of the atmosphere’ created by a folksong, Britten wrote, bore similarities in its affects to the very source which inspired much of it: the English countryside. Lacking the dramatic variation or surprise one might encounter in rural Europe, the English landscape seduces us in gentle stages. So too, wrote Britten, did English folksongs: ‘They creep into the affections rather than take them by storm’. Yet while these works were an interesting source to Britten, he did not see them as central to his oeuvre, claiming quite rightly that while folk singing was no longer part of the social life of the people, any composer who used it to justify their musical existence would be doomed to failure. ‘No one would dream’, he wrote, ‘. . . of founding a school upon the music of a composer like Donizetti: whereas folk art is in finitely narrower than that delightful but limited master.’ Those recalcitrant enough to insist on taking such a path would soon discover that the brevity of folksong would never lend itself to model extended musical form — the very form necessary to be taken seriously as a composer if international pro file was seriously being sought. For Britten, then, folk art had to be treated with some degree of caution, for he saw it as the product of amateurs: talented, gifted amateurs, certainly, but amateurs nonetheless, while he perceived his role, as a professional musician and composer, was to massage the original folksongs into a much more finished and aesthetically-pleasing whole. Hence, therefore, his tendency to allow his accompaniments to lend themselves to pianistic enjoyment, bordering on the Lied or art song: he did not seek an ‘authentic performance’, but rather, it seems, an ‘authentic experience’. Musically sure of himself, Britten made the folksongs substantially more sophisticated than they originally appeared, through a greater complexity of lines supported by harmonies and textures designed to colour the words. As a composer who claimed to have been most influenced by Henry Purcell in his setting of words to music, his work is at times surprisingly florid, yet very, very tonal. Like Purcell, Britten also loved the ostinato bass and this forms the foundation of several of the works (most notably ‘Come You Not From Newcastle?’). In total, the musical experience is as valuable for the pianist as for the singer and for the audience. This is not a passive relationship: you are required to be involved. The works heard on this recording were mostly scored during Britten and Pears’ time in America, to which they had fled at the outbreak of war in 1939. Their residency there, until the spring of 1942, seemed to precipitate in the composer a need to focus on things British and thus the first collection of Songs (British Isles) was produced and performed during this time, to be published in 1943. 1946 saw the appearance of the second volume (songs from France), 1947 the third (more from the British Isles), while volume four (Moore’s Irish Melodies) did not appear until 13 years later, in 1960. Five (British Isles again) and six (songs specifically from England), however, both came out the following year. It is worth bearing in mind that this magnificent contribution to the history of British (and French!) folksong could not so easily have been achieved had it not been for the nimble intelligence of Peter Pears, who so impressively premiered many of these folksongs, with his aesthetic sympathy, mellow timbre and pristine voice. This compilation is an accurate demonstration that folksongs are rarely happy. They were about real life as their first singers experienced it and might perhaps be considered an initial manifestation of ‘music therapy’, as they eased communities through life-cycles, rites of passages, loss and — occasionally — joy. But life was tough, and mostly they reflect an accurate disquiet about the brutality of birth, death, unfaithful lovers and the seeming futility of it all. If we want to understand these works, we would be wrong to over-romanticise them. The original folksong texts themselves are fascinating, for they betray their original function as short stories carrying a moral message or counselling the listener to enhance their strength of character (‘Little Sir William’), or indeed, both. While an occasional item, such as ‘Oliver Cromwell’, was little more than a political broadside from Suffolk articulated as a children’s nursery rhyme, others carry a hefty sting in the tail — designed to keep the listener attentive to the end. ‘The Ash Grove’, ‘The Trees They Grow So High’, ‘O Waly, Waly’, ‘Ca’ the Yowes’ all do this to varying extent. 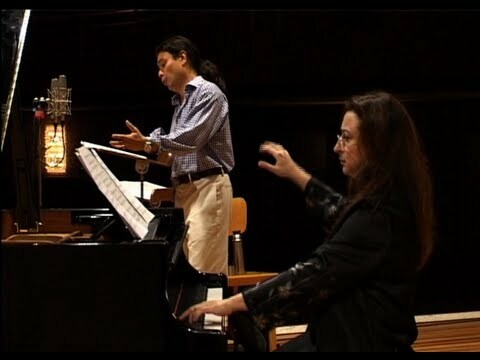 And just as the first performances heard the remorseful tenor of Pears’ voice sweep the listener into the story, so too, with passion and with flair, does the winsomeness we hear Steve Davislim express in this recording.